"When I was eight I saw my first live band and it was teenagers playing covers in a park. To me it was Led Zeppelin! My parents could not pull me away from this bandstand. I was immediately bitten by this bug. I started this campaign for a guitar and, after about six months of tantrums and work, I got a guitar for Christmas in 1973. It was an Epiphone acoustic, a big dreadnought." Carlos Santana said, 'This is my friend Brian!' and started playing and I just jammed with them. My brain shut down! "When I got [The Damned's] Machine Gun Etiquette that was the record when I went, 'Oh my god', because in Captain Sensible we had punk rock plus Pete Townshend. Captain was just great. He was the first punk guy playing guitar solos, but not taking himself too seriously. I identified with that. And he had bleached hair and glasses…"
"[My friend and I] got passes to Santana at [Detroit's] Cobo Hall in 1978. We got backstage and I had no sense of protocol so I just walked up to a guitar and started playing! They didn't yell at me, so I played for five minutes… this midget playing proto-Captain Sensible solos! We watched the whole show and when they were coming up for the encore, one of the roadies put a guitar on me and started pulling me out to the middle of the stage! Carlos said, 'This is my friend Brian!' and started playing and I just jammed with them. My brain shut down!" "There were so few people that could play instruments in DC that I think I got chosen for Minor Threat by default. They needed a bass player and the people in the punk scene knew I could play guitar, and it was the idea of, 'Well, how hard can bass be?' It was comical because actually bass is, in fact, much different to guitar. I went in and I was playing chords and Ian [MacKaye] was like, 'No, it's really one string at a time. That's probably better…'"
"Minor Threat's first show was opening for Bad Brains in the living room of a group house. I would say there were maybe 40 people there and 20 were in the kitchen, drinking or smoking pot. It was exciting to be a part of it, but it was still just something you would do for fun. At the time I wouldn't have considered it any kind of art form, but now, looking back, these were just artists doing their thing." "[Whether it's Minor Threat, Dag Nasty, Bad Religion]… The fact is that I really love playing guitar. I play every day. I really love it and I care about it and I want to do a good job. I have been this way ever since I started playing, like 43 years ago! So the advice is: you have to keep doing it. If you don't love it then it doesn't matter… I don't do a lot: I do one thing pretty well and so far I've been very fortunate." 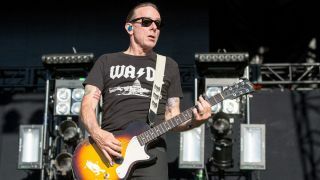 "I've finally got it down now: I play a guitar that is much older than I am, plugged in to amps that are older than I am and nothing in the middle. "The freedom of knowing that the only thing that's going to go wrong with it is me, that's fantastic. The best songs are the ones you can play on an acoustic, so if your song relies on a combination of different flangers, there's a chance it might not be that good! Just saying…"